How is Novadermy different from other rejuvenation procedures? This procedure is NOT a face lift, it is not a temporary superficial chemical peel, and no toxins are injected into the face. Novadermy has successfully prevented many people from having surgery, which has many side effects, including scarring, long recovery time, altered facial structure, toxicity (anesthetics and their many risks), temporary local effects, and frequently unsatisfactory results that usually require repeat surgery. If any of your friends or loved ones are planning or contemplating a surgery, they will thank you for dissuading them from that violent approach and for encouraging them to select a much better option: surgery just stretches the skin, but it is still the same visibly damaged, aged skin! Additionally, stretching of the skin reduces its circulatory supply drastically, causing it to age even more rapidly, reassuring the surgeon of another visit within several years. Chemical peels and shots never last long, and require repeat visits, repeated toxic exposure, and greater cumulative expense. Novadermy restores your facial circulation, your skin's elasticity and collagen structures, and the skin's texture to its youthful plumpness and smoothness - therefore the results are *permanently* supported by the skin's physiology. Laser treatments used to be popular because they appeared modern, but they have lost popularity among many of the skin surgeons who found them to be destructive to the subdermal layer. In many cases the skin became extremely thin and fragile, with fine lines and ridges which formed as a result of the trauma. Many doctors who have been using these procedures for 10 to 15 years, have disavowed the use of lasers for this reason. "Thank you so much for introducing me to Novadermy and Dr. Vargas. First of all, when I heard that the procedure is in Tijuana, Mexico, I was thinking of how it was 20 years ago. I was very happily surprised with the high-rise hotel and the modern medical office buildings overlooking a golf course, where Dr. Vargas performs Novadermy. He and his staff were wonderful and the accommodations were excellent. Now two years after my Novadermy everyone says I absolutely do not look my age of 62. Before Novadermy, I used to have many wrinkles and sagging, damaged skin. Now, most people think I am in my late 40’s (or early 50’s). My skin is very smooth, firm and has only very few wrinkles. The area around my eyes is also smooth and firm. My secretary tells me that most people my age have sagging skin especially around the cheeks and jaw, lots of wrinkles and pock marks. Just like you and Dr. Vargas said, Novadermy has helped my own skin revitalize and rejuvenate and it is continuing to do so. Again, thank you so much for making me aware of Novadermy. -June G. Cravenn, Vice President,US Bank, SBA Division, Las Vegas, Nevada"
What is the actual process of Novadermy? Novadermy is a 10-day process consisting of four phases: 1. Exfoliation 2. Inflammation 3. Stabilization and 4. Contraction. In the first phase, a proprietary facial peel is administered under mild sedation. It is extremely safe and does not cause irregular pigmentation, unlike common deep chemical peels that have been popularized since the 70's. After 40-44 hours, the exfoliation is completed, and immediately a soothing solution of growth-stimulating stem cells (placental cells resulting from the birth of calves in Argentina) is applied. The face is briefly exposed to the soothing placental solution (just a few milliliters) only once (right after exfoliation, when stem cells can do well). The mask is formed during the next several days by a stimulating powder (see the second phase) combined with the fluids secreted by the irritated skin. The second phase (Inflammation) starts as soon as an "irritant powder" is applied to the exfoliated face. This powder (together with the skin's inflammatory juices) forms a mask on the face. The third phase begins when the mast has fully formed and the irritation is over, whereby the new skin stabilizes under the mask as the inflammation decreases. During the last 2 days, the mask is made to contract (a proprietary technique) in order to reduce the production of superficial skin while the new dermis underneath the mask is still increasing in volume. 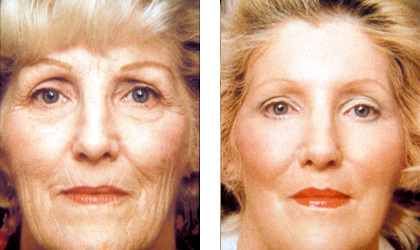 This is the last phase (Contraction) which removes the "draping" effect of excess skin that is seen with aging. Thus, the skin is again tight and smooth and under pressure, allowing a "lift" effect and eliminating the gravity-caused sagging of facial muscles. Where is it performed? What's the duration? The procedure, which takes 9-11 days to complete (depending on the initial condition and age of the skin), is performed by a licensed, experienced doctor with over 35 years of Novadermy experience. Most of the time is spent in a 5 start hotel very close to the border. The first day is in an extremely modern medical-surgical facility, but the rest of the time will be spent in 5 star hotel accommodations right next to the border near San Diego. Medical foods (professional-quality, nutritionally-dense, tasty powder mixes as meal substitutes, eaten with a straw to prevent facial movement) that support metabolism, healing, and healthy body composition during the entire process will be provided (the participants will order them) at an additional $150-$250 per person, thereby eliminating all other food costs. You can order UltraMeal Rice - Natural Vanilla (3-4 canisters; Sku#: H323RV) and a shaker cup (LB100) online at www.nutri-dyn.com or call: 1-800-444-9998. Please register as a patient and use doctor # 100746. Bring a shaker cup for easy mixing. What is the name of the doctor who does the actual process? Dr. Salvador Vargas (American MD licensed in Mexico, not in the USA) is the only doctor who is currently performing the procedure. He has been doing this for over 35 years, and is considered the world's expert in the art of Novadermy. He's also actively participating in stem cell research and attends stem cell conference regularly. Tell us more about Dr. Vargas. Although Dr. Vargas is mostly a cancer specialist seeing American cancer patients in his Tijuana clinic separately from the Novadermy location, he is very happy to perform Novadermy, thereby preventing this art form's extinction. During the early 1970's, he initially studied very similar procedures that were originated in Europe, and were more commonplace in America as well. He then gradually developed the final Novadermy process while refining his own technique. Unfortunately, the procedure lost favor with American doctors because the art requires a learning curve to reach mastery. In addition to that, the per-patient time-commitment didn't justify the income for American plastic surgeons. They earn much greater income cutting people for 2 hours (with guarantied repeat business) rather than providing the labor-intensive non-invasive Novadermy for a lot less (with no repeat business). 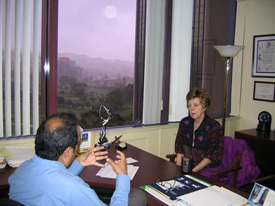 Dr. Vargas enjoys the artistic aspects of Novadermyand the rewards of seeing the patients happy afterwards. His difficult cancer patients don't often provide him with such a long-term rewarding experience. Have there ever been any adverse effects with past patients? Since Dr. Vargas does very careful screening (medical and mental history, as well as a thorough exam, blood work, and ECG), and does not accept any "risky" patients (those with uncontrolled hypertension, severe psychosis, dark/"olive" skin, serious lung disease), there have never been any complications or adverse effects in over 35 years. There was one incident of a psychologically unstable patient who did not follow instructions and kept moving her face during the stabilization phase against instruction and exposed herself to the sun prematurely right after the procedure. As a result, she required a repeated Novadermy procedure which was performed successfully. "I am completely satisfied with the Novaderma process. Dr. Vargas is an exceptional doctor and extremely personal and so are his nurses and other workers. Their facilities and care of you is topnotch. We were very well cared for and a nurse stayed with us each of several nights, which other than the first night is not really necessary, but a nice precaution. Anyone wishing to have healthy-looking skin that is alive and youthful again should definitely consider this treatment. J. S. - Washington State"
Why haven’t I heard about Novadermy before? There are many medical approaches that are rarely used (or no longer used) in the USA but are accepted (or commonly used) in other countries (e.g. UV hemo-irradiation, Hydrogen Peroxide Therapy, Ozone Treatments), because of political and financial considerations. If the sponsors of medical schools don't benefit from it, it usually does not get taught. If the procedure competes with more profitable procedures, it gets replaced or forgotten. If the procedure requires additional time commitment and knowledge to perform (without sufficient compensation), the interest in it might get lost. If it seems "old-fashioned" and "artistic" - the more "impressive" modern instrumentation of surgery (i.e. laser, face-lifts, and injections) tend to supplant it. And if it is developed slowly by just a few enthusiastic practitioners over a period of 30 years, with no marketing skills and no formal instruction of a new generation of practitioners, it becomes ignored or forgotten. Word-of-mouth is not a good marketing resource in the highly-confidential world of dramatic facial rejuvenation. Novadermy requires too much "hands-on" time for a doctor who performs it in the USA to feel well-compensated, especially when there is so much money to be made with quick surgical procedures that practically guarantee "repeat business." On the other hand, in Mexico the compensation for such an artistic, time-consuming procedure is considered sufficient. Novadermy works so well and provides such good results for so many years, that it requires continuous marketing efforts to acquire new patients. It is our goal to popularize Novadermy again by having American assistants work with Dr. Vargas to reduce the immense time requirement shouldered entirely by him until now. How does sedation happen for the procedure? The sedation is done intravenously - it is not a general anesthesia, and there is no need for tracheal intubation. Only a non-invasive laryngeal mask is used. Sedation lasts approximately 2 hours while the exfoliating formula is applied. This is done under the supervision of a Board-Certified anesthesiologist in a fully-equipped operating room. Has the exfoliation ever damaged the pigment or deep layers of the skin so that the patient has to always avoid the sun? The patient can enjoy the sun after Novadermy (except for the initial 90 days) without concern. Excessive exposure is not a good idea regardless (as it will age the skin faster), but normal, healthy moderate exposure poses no risks and no avoidance is necessary. We don't accept patients with olive skin (or darker pigment), where the pigmentation is uneven throughout the thickness of the skin - therefore we never have a problem with damaged (irregular) pigmentation. Exfoliation does not remove the deepest pigment layer in lightly-pigmented individuals, who therefore remain evenly pigmented after the procedure. "Olive" skin refers to the darker Mexican skin type (the Mexicans whose skin is relatively lighter can enjoy Novadermy with no adverse effects). Are there any risks of infection with Novadermy, rejection of the placental cells used in Novadermy, or the possibility of blotchy new skin coloring following the procedure? There have never been any concerns regarding such risks, since the patients are thoroughly screened for the procedure. No infection has ever occurred, since there is no cutting (no open surgery) or bleeding and since the powder and the initial peeling formula are antiseptic, plus the procedure is done under sterile conditions. No rejection can ever occur, since the placental cells are NOT a "live graft" and are NOT embedded permanently into the skin- they are just providing the temporary growth stimulation superficially before the mantle is formed (the mantle is the protective layer that ultimately gets sloughed off as the under-layer grows thicker with the powder above it). The remnants of these cells are completely removed from the live skin when the mask is taken off just 7-8 days after they have been applied. No blotchy coloring has occurred, because the formula is mild enough to NOT reach the melanin-producing cells, unless the patient has black or very dark olive skin- in which case the procedure is not done. It's all about selecting the appropriate patients! No other complications have occurred because patients with contra-indications (high blood pressure, severe lung and heart disorders, psychosis, and highly-depressed immunity/AIDS) are not accepted, and because all patients are medically evaluated prior to the procedure. In 35 years there was one case of a person for whom the procedure did not take because she had a very unusually resistant skin. Even if the material did not fully penetrate her resistant skin, there was significant improvement, but not to the degree that we would have liked. For this reason, this client will be doing the procedure again at no cost to her because we would like to ensure that she gets the very best results possible. What is the procedure that needs to be followed if one wants to have the neck and chin done as well? During the initial consultation, Dr. Vargas may make recommendations regarding the neck, if necessary. Most of the time, the neck improves considerably because of the facial "lifting" effect of Novadermy. If a small additional procedure is warranted, it may be done easily at the end of Novadermy. No prior scheduling is necessary in that case, but you may need to stay an extra day in Mexico in such an event. Most people did not require any additional work done on their neck because of the effectiveness of Novadermy. Will Novadermy work as well on the neck? Novadermy restores the skin and lifts the muscles that are attached to the facial bones. However, the platisma muscle, which connects the neck to the chin, is not attached to bone, therefore graviy causes sagging of that muscle and its underlying tissues over the years. Even if the skin gets renewed, the lifting effect is not as dramatic. That's why Novadermy does not address the sagging skin on the neck with the same success as it does the face. Although some improvement is definitely noted as seen in the pictures. Also, the neck does not enjoy the blood perfusion (dense circulation) that characterizes the face - therefore the healing time is too long for the desired results to manifest under the mask during the procedure. However, a special compound is utilized on the neck's surface and the upper chest to even out the area between the Novadermy-treated face and the upper chest, leading to satisfactorily smooth transition. Are the photos all original? Why do they seem old? How can I refer others to enjoy Novadermy's benefits? For now, please refer people to our website, www.novadermy.com or invite them to contact our office at clinic@ecopolitan.com. By referring others to Novadermy you can save $400 off the cost of your own registration! I’ve visited Dr. T’s website and looked at the before and after pictures and am impressed. 1. Is this procedure done in an accredited surgical center? Yes, since 1987. Hour Calente Complex Centro de Cirugia Cosmetica Integral. Didn’t have tele # with him. 2. Will there be an initial one-on-one health evaluation consultation with each patient? Yes, group consultation first w/EKG & blood tests. When results in then one-on-one consultation. 3. What is the best way to prepare physically for this procedure? Any supplements/medications which should be taken or discontinued? Do not stop any prescription medication. There is no cutting involved. 4. How long have you been doing this procedure? Interned in 1975, and then began doing it alone in 1979. 5. Did you create this procedure yourself? No. It was developed in the 1940’s in France, and then modified in 1979 for safer and better results. 6. Please explain what exactly the chemical does to the skin. Remove top layers to promote new healthy skin/remove scars, etc? Removes the top layer to get to the dermis which induces reorganization of the dermis. Doesn’t destroy dermis like laser therefore has a longer time effect. 7. What is the expected time frame to see full results? 7 to 9 days plus 1 extra day for each 10 years after 50 years of age. 8. Is there any down side to this procedure? If so, has it happened to anyone? How have you handled the situation? No down side and nothing controversial has happened to anyone. Can possibly expect the following: 1. Sometimes peeling; 2. Sometimes redness (Cortisone cream used); 3. Sometimes superficial scabs which will shed within 7 days; 4. If you go into sun prior to 4 months, skin can become blotchy. No direct sun for 4 months, then resume normal regimen. 9. Do you guarantee your work and if needed re-do it at no expense to the patient? Yes. 11. Do you only do this procedure in Tijuana? Yes. This is where Dr. Vargas’ license is held. Also the procedure should be monitored 24/7 by Dr. Vargas and a registered nurse. 12. I understand that during the procedure the patient is put under a twilight sedative for 2 hours? Yes. No Propofol. Uses non-toxic Fentanyl. Anesthesiologist present during the entire procedure. 13. If a patient has a history of getting nauseous from anesthesia and throwing up, what alternatives will be available? Must discuss with Dr. Vargas because need to be sedated for this procedure. 14. Why are they put under a twilight sedative? It’s very painful for 2 hours. A person can only take the pain for a short period of time without wanting to be sedated or commit suicide. 15. Who or what skin disorders are your best candidate for this procedure? Hyperpigmentation/Melasma/wrinkles/scar tissue/acne/Rosacea? Caucasian, Mediterrean, Northern Italian, Greek, wrinkly/thin/dry skin, blends scar tissue and hyperpigmentation. 16. Is there anyone who is not a candidate? Ethnicities? Age? Arabic, Latin, Indian, Olive complexion, unstable diabetic (taking insulin), high blood pressure, glaucoma, oily, rosacea, psoriasis, vitiligo, melasma, claustrophobic, ADS, scleroderma, colitis, asthma, hepatitis, HIV positive. Other health contraindications should be discussed with Dr. Vargas. Didn’t say whether men could have this procedure or not (compromise their beard growth?). Can’t bring pigment back. They should look into light treatments. 17. If a patient has a history of laser and chemical peels is she still a candidate? The skin is thinner. Should talk to Dr. Vargas. 18. What is the level of pain/discomfort/burning? Do we take pain medication? If so, for how long? Maybe some for a few minutes after awakening. Pain meds through I.V. if needed. 19. What changes would a patient expect to see after the procedure and the skin is completely healed? Face/wrinkles softened, elasticity/plumpness restored, younger, labial fold not gone but smoothed. Not as drastic a change in the neck. But since the face will be lifted the neck will be as well. 21. Can your patient expect the same results on the neck and décolletage as the face? See answer to question #19. 22. I understand there is a mask involved. What is the chemical makeup of it? Fabric or paper tape. 23. Are the stem cells from bovine or plant sources? Placenta cells from bovine to stimulate circulation. This is applied immediately after the procedure then tape applied over it. 24. Is this a mask which is in liquid form, applied to the skin then dries to form to the skin? Or a separate mask with the product on it which can be taken off to brush teeth? Tape mask, cannot be taken off by anyone but Dr. Vargas. 5. Are there bandages involved to keep the mask on? Claustrophobics? The bandages are the tape. Claustrophobics may not me a candidate. 26. I understand the mask is worn 24/7, is that correct? Yes, tape for 48 or so hours then a second dry mask is applied. 27. Who removes the mask and when? Dr. Vargas only. 28. After the mask is removed what solutions should one use? Not applicable to procedure. 29. How does the patient get from the surgical site to the hotel? Walk and or van. 30. How long in the hotel? 8 to 10 days, depends on age of patient. 32. I understand there is a licensed nurse on staff at the hotel while patients are recuperating? Is he/she there 24/7? Yes, does 2 to 3 rounds day and night. 33. Can the patient go home to recuperate rather than staying in the local hotel? No! 34. I understand there is a formula which everyone drinks. Is this because we aren’t allowed to chew or does it aid toward the best interest of the skin treatment? Both. No chewing allowed because can cause skin stretching. Formula is for nourishing the body/skin and also loosing weight. 35. Are we allowed any food other than the formula? Liquid intake only for the stay? Liquid diet only. 36. What is the formula made from? Ingredients organic/vegan? Yes, organic/vegan. 37. I assume there will be peeling involved. How long does that usually last? Not necessarily. Do not peel off mask even if you see/feel a little hanging. Dr Vargas will remove when time. If don’t follow directions then the patient may have excess peeling later. 38. When can makeup be worn? Patient leaves with oil on the skin. Makeup may be worn the following day. After care directions will be sent home with patient. 39. Will there be any need for touchups? Of so, how often? If touchups are needed it’s administered during the stay. 40. Tell us a little about yourself. You are an Oncologist, why do you offer this service? Became Oncologist in California in1975. Introduced to Novadermy 1975. Modified formula in 1979 adding stem cells. Began doing it again in 1983. 41. How long have you been offering this service? See above. 42. Perhaps we misunderstood but are you planning to retire from doing this procedure soon? Educating in Seoul, Korea? Educating Oncology in Korea at this time. Will finish there soon. Perhaps go to other regions to teach as well. But lives in Escondido, CA therefore will continue to do the Novadermy procedures for a few more years. 43. Are other physicians doing this in the states? If not, why? No, they don’t have the formula. Also, with hotel stay plus round the clock staff it’s not cost effective in the states. That is why he does this procedure in Mexico. 44. Is this procedure FDA approved? Yes, theoretically. The principle is approved. 46. What is the cost? Must talk to Dr. T or Caroline Andrews for price quote. 47. Are there any extra expenses to be prepared for? He was unsure. One can always run up an extra tab at the hotel. 48. When is the next procedure date? He was unsure. 49. How many patients does he need to do a round of procedures? 6 to 8; 3 to 4 per day. It takes a week or longer for each group. 50. Will there be bottled water available? There will be as much as you need as well as teeth q-tip swabs and mouthwash. A few extra notes: 1. Only need to bring indoor clothes. Pajamas, etc because you won’t be going outside. Can bring work out clothes if you want to use gym facilities once it’s okayed by Dr. Vargas. 2. He does not remove moles but will remove sebaceous keratosis and skin tags. Need to check to see if there is any extra cost involved. 3. Can remove keloid or hypertrophic scars only above the skin, not below. "After" pictures were taken immediately following the Novadermy procedure. In some cases the oily or shiny appearance is due to the oil that is applied for the 12 hours immediately at the end of the procedure. Complexions will continue to improve as the new skin matures during the next three months. Studies published in “Reconstructive Surgery,” May 1986, by Dr. Klingman of the University of Pennsylvania School of Medicine and Doctors Baker and Gordan of the University of Miami School of Medicine, confirm that the good results will last for at least two decades. Even the scars, blemishes and unattractive skin conditions that you thought you would have to live with your entire life can be improved and eliminated with Novadermy. With Novadermy’s 10 Day Anti-Aging Skin Rejuvenation Treatment you'll literally regain the youthful glow and healthy skin you had as a young child. Unlike the unpredictable, potentially risky after effects of surgery, Novadermy's benefits are permanent. Read more about how with Novadermy's unique rejuvenation procedures you regain your youthful skin permanently! It’s not just about looking younger; it’s about actually regaining that healthy, unscarred skin you had when you were young!! Dramatic results can be achieved on many different skin problems with various levels of damage! Additionally, your circulation will increase 300% sustaining and nourishing the new, healthy skin for many years to come. Novadermy is a non-surgical, permanent, extremely-effective rejuvenation of the entire face, leading to dramatic, long-lasting results that reduce the appearance of aging by 10-20 years. 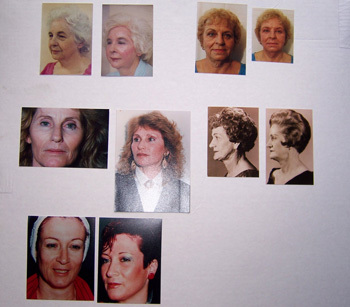 Novadermy is a comprehensive solution for those with mildly or severely aging face and upper neck, including folded skin, grooves lines, spots, sun-damage, abnormal pigmentation, wrinkles, enlarged pores, mild scars, pits, reduced circulation, thinning collagen, loss of elasticity, drooping facial structures, and/or sagging skin. "There is nothing like it out there. The results last well over 20 years! 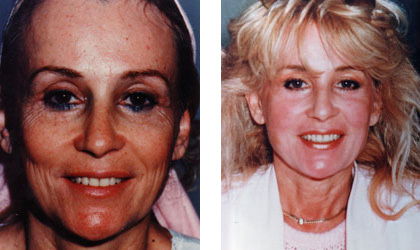 I still see the very happy patients who did it in the early 80's, and I am amazed at the permanence of the results!" Not only a marvelous procedure for aged skin, Novadermy also erases youthful freckles, acne scars, enlarged pores, sun and “liver” spots, as well as other skin conditions affecting young people. Novadermy is performed exclusively by medical doctors in a fully equipped operating room (for any unlikely emergencies). The clinic is on the 17th floor of “Plaza Agua Caliente”, a truly modern medical complex servicing mostly Americans and Canadians, located just 5 minutes south of San Diego, California. This non-surgical process effectively removes aging and damaged skin, along with its wrinkles, lines, roughness and discolorations. By utilizing a proven, revolutionary 10 day process in combination with vital placental stem cells, Novadermy guarantees the formation of an entirely new network of connective tissue and blood vessels. Within the new skin layer there is an abundant regeneration of elastin and distribution of new collagen bundles. These combine with newly formed blood vessels to ensure a continuous, life-giving blood supply that will make you look years younger for the rest of your life. Novadermy is not to be confused with highly advertised cosmetic applications of cell extracts that temporarily moisturize your face, nor with face lifting or peeling. Live Cell Novadermy is a proven medical procedure employing non-invasive techniques that, without the pain and risk of surgery, permanently replace aged, damaged and scarred skin. Your skin will regain the texture of youth, once again becoming soft, supple and firm without the unnatural, distended or temporary effects of surgery or chemical peels. Live Cell Therapy (made famous by Dr. Niehans) and Novadermy, are the only clinically proven European bio-technologies which actually revitalize men and women’s cell tissue activity to suppress the aging process. Russian biologist and physician at the Leningrad School of Medicine, Dr. Vladimir Filatov, pioneered live cell bio-genic regeneration of burn-damaged tissue. 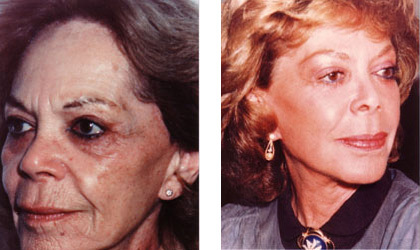 This technique was further refined and perfected at the Pasteur Institute in Paris, for cosmetic use in replacing scarred, discolored, and prematurely aging skin.